Nursing informatics competencies are constantly changing in response to advances in the health information technology (HIT) industry and research emerging from the fields of nursing and health informatics. 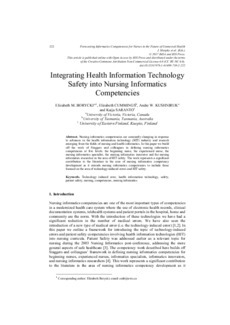 In this paper we build off the work of Staggers and colleagues in defining nursing informatics competencies at five levels: the beginning nurse, the experienced nurse, the nursing informatics specialist, the nursing informatics innovator and the nursing informatics researcher in the area of HIT safety. The work represents a significant contribution to the literature in the area of nursing informatics competency development as it extends nursing informatics competencies to include those focused on the area of technology-induced errors and HIT safety.